Hello Stampers!!! I am super excited to announce my new adventure with my Stampin' Up! Team!!! 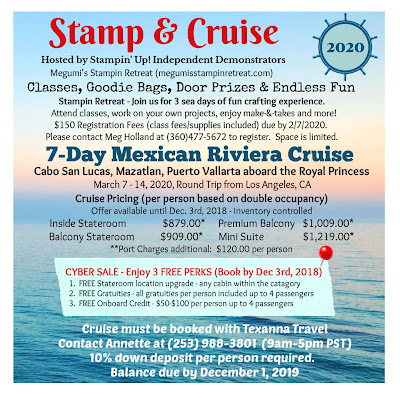 We are hosting a Stamp & Cruise to Mexico in March of 2020!!! We have done some team events in our local area and now we are taking it to the Mexican Riviera with a help from one of our Team Members, Annette!!! She is the owner of Texanna Travel and has been specialized in cruises for many years. We are so thrilled to have this opportunity to do some fun crafting while visiting fantastic destinations in Mexico. We are hoping many of you could join us on this exciting adventure! Please note that the following prices are available until December 3rd, 2018 (inventory controlled) in addition to the 3 for FREE Promotion offer. FREE Gratuities - all gratuities per person included up to 4 passengers. Cancellation Policy - Please contact Annette for more details. You may cancel your reservation by December 1, 2019 for a full refund. Stampin Retreat - Classes, Goodie Bags, Door Prizes & Endless FUN!!! Join us for 3 sea days (and more) of fun crafting experience!!! Attend classes, work on your own projects, enjoy make-&-takes and more!!! Please note space is limited. How to register - After booking your cruise, please email me at megumih4stamps@hotmail.com. I will contact you to confirm your reservation. The cruise prices shown above are being offered until December 3rd, 2018. We believe these prices are a great deal! You may book your trip after December 3rd, 2018; however, these prices may not be available after December 3rd, 2018. The 3 for FREE Promotion is available until December 3rd, 2018. To lock your cruise price with the 3 for FREE Promotion, you must book by December 3rd, 2018. Please don't hesitate to contact me with any questions. We hope to have many crafters onboard with us on this exciting adventure! !